Have you seen Spades played and wanted to get in on the action? This game is played by millions of people and can even be a family event! All you need is a deck of cards, a scorepad, and four people. Add a little practice, and you'll soon be a cutthroat spades player ready to take on the pros! Spades is a popular card game designed for four players. The game is played in pairs. To start, each person must sit diagonally across from their partner. The person on either side of you should not be on your team. The goal of Spades is to be the first team to reach 500 points. All of the cards are dealt, so each player has 13 cards. A two is low, and an ace is high. It is advisable to put your cards in suit and number order. For example, your had should be divided by spades, diamonds, clubs, and hearts organized by value. Once you have your cards, you are ready to make a bid on how many tricks you plan on taking in the round. Now, you are required to bid on how many tricks you think you will take. How many of your cards will beat out other cards thrown? The only guaranteed trick is the ace of spades. After this, high spades are likely to take tricks, aces and kings of other suits are high, and if you are "light" on a specific suit, you likely will get a chance to trump it early. You cannot talk openly with your partner about bidding. You make your estimate without input from any other person at the table. The player to the left of the dealer bids first. The bids of each team member are added together. If you bid four and your partner bids three, the team total is seven. Now, you are going for seven together. 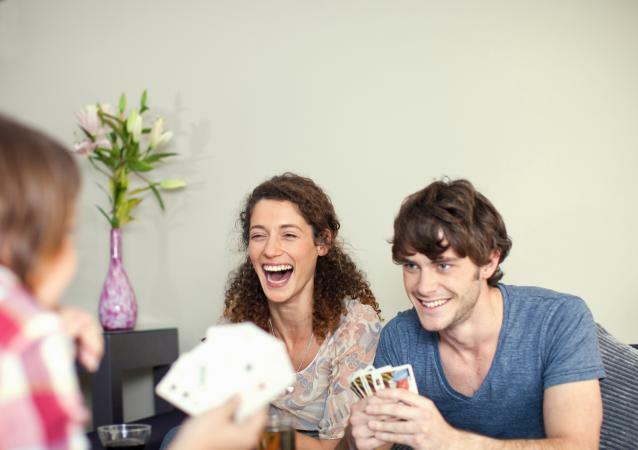 Players have the option of bidding nil or blind nil in the game of spades. When bidding nil, this means the player intends to not take any tricks. If you achieve this goal, the single player gets 100 points, plus any points earned in your total bid by the other partner. If you don't reach it, you go down 100 points. Blind nil is the same except you bid blind nil without looking at your cards. Its value is 200 points, but if you don't succeed you go down 200 points. Remember, blind nil is really risky because if you have the ace of spades, you automatically lose 200 points before the round is even played. Before you can bid on tricks, it is essential to understand the basic rules. Spades is the trump suit. A trump card always beats any other suit in the deck. If hearts are thrown but one player puts a spade on the table, the spade wins. This is true even with an ace of hearts against a two of spades. If two trump cards are thrown in the same trick, the highest trump card wins. When one person throws a specific suit, you must follow the suit unless you do not have it. For example, if you have three hearts in your hand and another player starts the round by throwing a heart, you must put down one of your three hearts. If you do not have a heart in your hand, you can either throw another suit or a spade (trump). You cannot lead with spades unless the suit has been played on another turn. If you are low in one suit, it is likely you'll be able to throw a trump card early in the game. Once you understand the basics, it's time to start taking tricks and playing to win. The game continues in rounds of 13 tricks until one team reaches 500 points. Put down the highest card if all players follow the original suit. If all players put down diamonds, the one with the highest diamond takes the trick. Put down the highest trump card. If the lead throws a diamond, two others throw a diamond, and a final player does not have a diamond and puts down a spade, the spade takes the trick. Put down the highest card of the original suit, if no trump card is thrown. Let's say the first player starts with an eight of clubs. If the next player throws a jack of clubs, the third player decides to place a three of diamonds on the table, and the final player is also out of clubs and puts a heart on the table, the jack of clubs wins. The player to the dealer's left makes the opening play, and everyone must follow suit if possible. The person with the highest card takes the trick. Note: On the first trick, you cannot throw the trump suit unless you were dealt a hand of all spades (which means no one else at the table has a spade in their hand). It is a matter of courtesy to collect the cards for your pair if your partner is the first one to take a trick. For example, if you take the first trick, your partner collects them. Collect the cards, put them in a stack of four, and rest them on the table near you. Tricks are kept separated so you can quickly count them and keep track of your bids. The player who took the trick throws the first card in the next trick. Play the round of all 13 tricks. At the end of the round, each team will have the number of tricks they took in front of them. If you and your partner meet or exceed your bid number, you get ten points for every trick you bid plus one additional point for tricks where you went over your bid amount. These points are called "bags." If you accumulate ten bags in a game, your team loses 100 points. If you and your partner do not meet your bid number, you get zero points for that round. When playing with three people, just take out the two of clubs from the deck. Deal the cards, and each person plays on their own. The full deck of cards is placed in front of both players. The first player draws the top card and decides if he or she wants to keep it. If no, the player discards his or her draw and accepts the second card on the deck. If yes, the second card on the deck is discarded. The two card process is repeated until the entire deck is gone. Each player will have 13 cards. The remaining 26 are not used in the game. Spades is a strategic game, once you get used to playing it. To take your game to the next level, try out some different techniques. Get to know your partner's bidding strategies. If he or she has a tendency to overbid or underbid, you may need to compensate your bids. If you are third or fourth to bid, consider what your partner bid. You may want to adjust your bid if they went especially low, because you just might take some unexpected tricks. Generally, you can count kings and aces as one trick each. High spades are one trick. If you have a bunch of spades and are light in a suit, you'll take one or two on this. Never take a trick from your own partner if it is a card you believe they counted in their bid. If your partner has it with a king of diamonds, don't throw your ace unless forced to. If your partner takes a trick in the above manner, it is likely an indicator they are out of that suit. If your partner loses a trick it is clear he or she expected to take, try to take a trick you might not usually work for to cover the loss. Pay attention to what your partner throws. If your partner leads with a card valued in the middle of a suit, they are likely throwing their only other card in that suit. If they play something strange, it is likely because they are forced to because of being out of a suit. Match your strategy to the number of tricks you bid. If you bid high as a team, like 10 tricks, you should play aggressively and take them right off the bat as a team. If you bid middle to low, play conservatively. You don't want those extra tricks at the end of the game. Generally, you don't want to bid nil if you have a hand long in spades (four or more) because the other team will likely make a run on your trump suit that your partner won't be able to cover. It's hard to obtain nil if you have three or less cards in one suit. You need a low deck of cards, with barely any troublesome cards. In cases where a partner has bid nil, it is your responsibility to throw high cards to cover them as necessary. If you have the lead, lead high. If you don't have the lead, see how it plays out and if your partner can get under. You need to preserve your own high cards to cover your partner. The more you play, the more intuitive spades becomes. 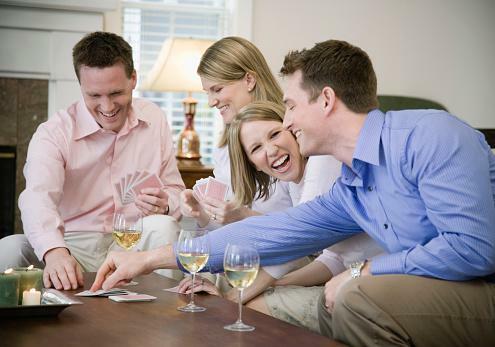 If you don't have four people to play with on a regular basis, there are other ways to play spades. You can play Spades Free on your iPhone. The Spades Free app is great because you get experience playing against a computer, and you can learn what it is like to bid with a partner familiar with the game. You can also carry your game of spades with you everywhere you go. You can play against the computer on this website. Playing online is similar to Spades Free because of the access you get to computers. It is also to play people as well, to get experience with all types of players. Alternatively, you can go to Facebook and play on the Spades Plus app. This app is awesome because it is possible to set up games with friends and family on the app. Spades is a fun game, and once you get started, you won't want to stop. Once you find yourself a good Spades partner, be sure to stick with that person! A good partner makes all the difference. Read through the rules, practice bidding properly, and play a few rounds to learn more. You'll love this game.